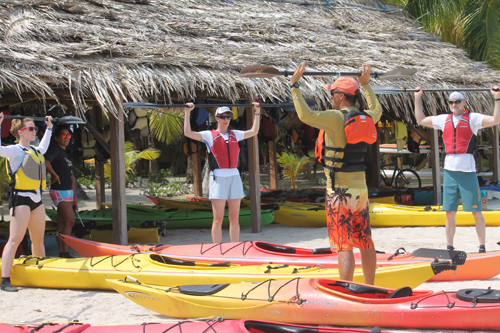 When you visit us in Belize, you will pack via our Belize packing list which you can request from us anytime. Our list includes numerous specific items in several categories: documents, clothes, and gear. Some of the items on the list may seem obvious, but we also recommend a number of items many would fail to think of. For example, you will need river booties, sun protective clothing (see photo above), and fleece underwear and a sweater for cold (“What” you say? “It’s the tropics!” Yes, but storms can blow through any time and the temperatures can fall as low as the low 60s). If you would like a complete copy of our packing list, send us an email at slickrock@slickrock.com or call us at 800-390-5715. We’ll happily mail one to you. One thing you may not anticipate, is that Belize is much closer to the equator than you are at your home in the US or Canada. For example, Moab, Utah, where I live, lies at 38.5 degrees N, and our island lies at 16.7 degrees N. So Belize is over halfway to the equator from Moab. We all know how sensitive to the sun we are, and we take our usual precautions, but when you get to Belize, your instincts and habits will likely not be correct. Sunscreen is great, but it washes off. The best thing you can do is to bring sun protective clothing, and wear it! The island has plenty of shade, but when on the water (and we are always on the water) you need protection. Slickrock Adventures has partnered with Coolibar to offer a number of items at a special discount when purchased with our promo code for 15% off on our recommended gear on their site. Visit the Slickrock page on their site to see the products we feel fit best with our active program: http://www.coolibar.com/slickrock. Coolibar’s swimwear line is ideal fast-drying clothing and is UPF 50+. Use coupon code “slick14″ when checking out; you’ll get 15% off your order!